Paul Dugdale and Jim Parsons whilst working for JA Digital planned and put together a dazzling video production covering these concerts, shot in 4K, using facilities from Telegenic and ACS (UK), all with a view to launch a global cinema event, Ed Sheerans Jumpers for Goalposts concert film debut, which will come to selected cinemas worldwide from Thursday October 22, 2015. Additional film screenings will be playing in select cinemas worldwide across the weekend of October 23 to October 25. This special cinema event will be beamed live via satellite from Londons world premiere in Leicester Square to select cinema screens around the world and will include red carpet highlights and an exclusive live performance, before showing the film in its entirety for the first time. The concert coverage is intercut with the story of Eds meteoric rise to fame. An integral part of shooting the shows was that we were able to get intimate shots of Ed and see detailed close ups of him playing the show, said Director Paul. Ed played entirely alone, the first time anyone has played entirely solo at Wembley Stadium, but as ever he used a loop station so that he can build the musical parts to create a sound far bigger than simply one man and a guitar. 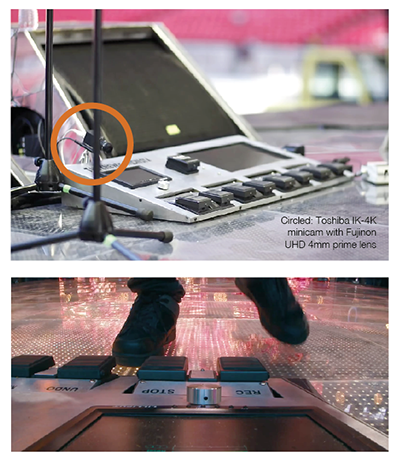 Capturing this element of his act was a crucial aspect of the film for both the myself and Ed, and Polecam Systems was able to supply us a tiny 4K minicam solution (the Toshiba IK-4K) via ACS UK that could not only be easily integrated into Eds onstage set up, but that could give us an incredible shot of Eds loop pedals at an unrivalled resolution for a minicam of this nature. Matt Coyde, ACS UK Sales Director: When JA Digital approached us for a 4K minicam solution the Toshiba IK-4K ticked all the boxes. 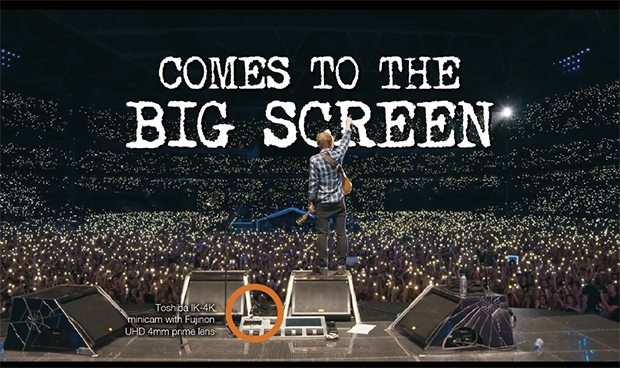 Weve had great feedback and based on the success of the cameras performance at the Ed Sheeran concert we are now looking into buying further units to satisfy our clients growing demands for 4K solutions. The Toshiba IK-4K minicam is the worlds smallest 3-chip UltraHD 4K video camera providing 8Mp 3840 x 2160 output and showing extraordinary detail with up to 1600 TV lines resolution. Video output is switchable between 4k, 1080p and 1080i formats to configure to any HD display and application - all in the worlds smallest 3-chip C-Mount package. Complementing the Toshiba 4K camera was a Fujinon TF4-XA1 UHD 4mm lens. The beauty of this lens is that in no way is the cameras performance throttled. Polecam Systems was appointed earlier this year by Toshiba Europe as the European Centre of Excellence for their range of broadcast products. Multiple Grammy nominated Paul Dugdale is a creative multi-camera, documentary and music video director who studied at Central Saint Martins School of Art London. His passion for music and film has led him to direct concert films and documentaries for some of the worlds biggest artists including The Rolling Stones, Adele, Coldplay, One Direction, Ed Sheeran and Mumford and Sons to name but a few.